Home » Our Doctors » Barry J. Davis, O.D. 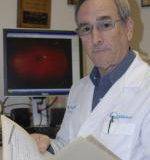 Dr. Davis, after nearly 50 years of optometric practice, continues to provide support to his staff and practice although he is no longer seeing patients. He surrounds himself with the finest optometric equipment, latest diagnostic instruments and a friendly and trained staff. Dr. Davis has received numerous awards for his humanitarian and professional services. He continues to make a significant impact in the community and in the optometric field.